When you download the theme package from ThemeForest you will see a directory named "Child Theme". Inside of this directory is "Marketify-Child-Theme.zip". Simply upload the .zip file like a standard WordPress theme. To edit these included files you can visit "Appearance > Editor" in your WordPress dashboard. You may also edit the files by accessing your web server via FTP. 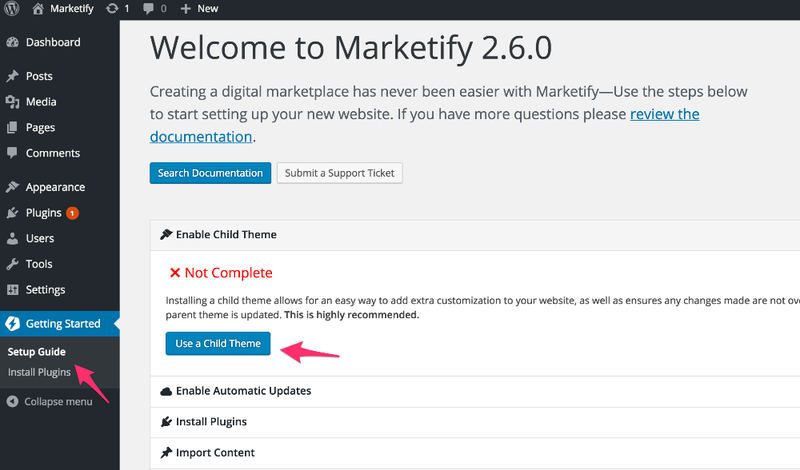 If you have upgraded to Marketify 2.8.0 you can now create a child theme directly from the parent theme in the setup guide. To create a child theme go to Getting Started ▸ Setup Guide and you'll see the first step is to enable a child theme. With one click, the Setup Guide will create your child theme and also activate it. Important: If you've already setup your website without the use of a child theme, you enabling a child theme will require you to reconfigure your website.